The weatherman said today was supposed to be cold and rainy with chance of sleet. Tell me why this afternoon we ended up tilling and weeding what will be our flowerbed out front without jackets. I guess I should know better by now when we have had several epic weatherman failures already this year. #Snowquester, anyone? 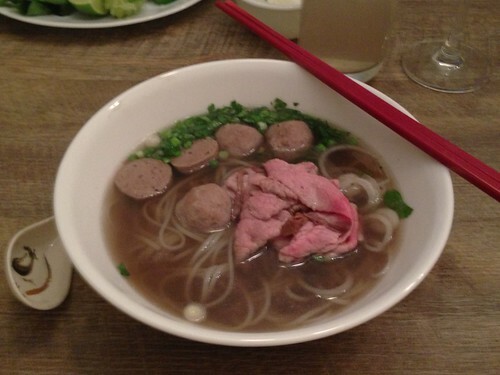 The one good thing to come of my faith in weather forecasting was another attempt at homemade Pho. 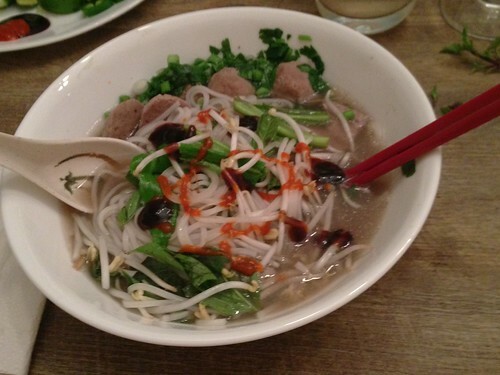 As an aside, Pho is pronounced as if you’re asking a question. Get that inflection going. This guy wrote an entire post about it. 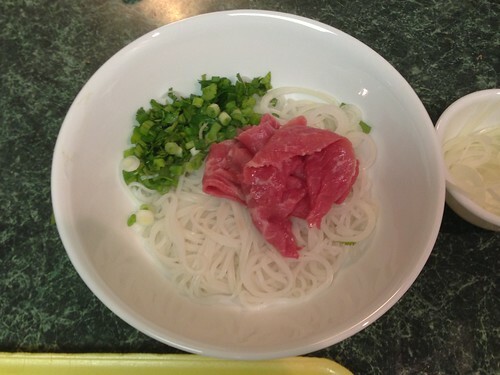 After my first epic fail attempt at pho, I now know what bones to buy. The first time all Super H had available were knuckles. We ended up with oily water and a last minute phone call to our neighborhood Chinese carry-out. 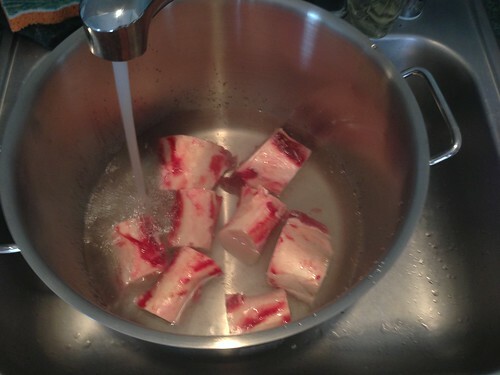 So this morning I was determined to get my sliced beef leg bones on my morning grocery store run. Me: [holding up package of nondescript beef bones] Excuse me, are these beef bones? Meat guy: Um, you want beef bones? Me: Yes, I want beef leg bones. Are these leg bones? Me: Perfect, this is exactly what I want. Meat guy: [head cocked] Really? Are you sure? This is what it’s like every time I buy ingredients for Vietnamese dishes that aren’t typical ‘American’ fare. It’s pretty entertaining to see the reaction, I must admit. Anyhow. So I got the beef leg bones, Tai (tie) – thinly sliced eye of round beef, Bo Vien (bow – yeen) – beef meatballs, herbs and vegetables for the pho. First things first. Get the nastiness and impurities off of the bones. Parboil and wash thoroughly before returning the mega-pot to the stove to get the broth going. Do you see how gigantic this pot is? You could wash a baby in it. Meanwhile, char the onions and ginger over a burner and get the other spices ready. Today I followed Andrea Nguyen’s Into the Vietnamese Kitchen recipe for Pho Bo, but after a day of simmering we still need modifications. 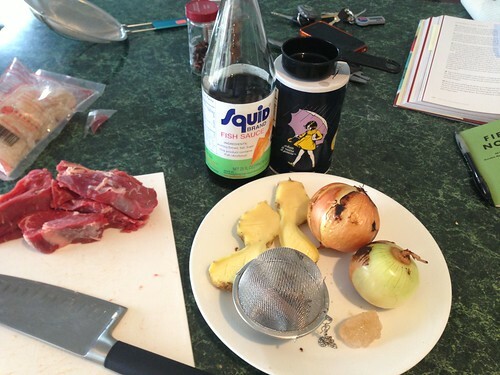 Trimmed chuck, fish sauce, rock sugar, ginger, onions, cinnamon, cloves and star anise. 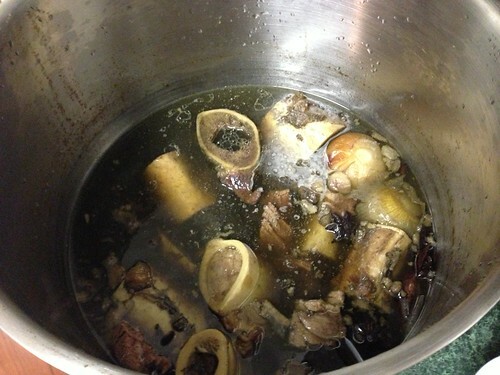 We let ours simmer all day to get all of the amazing marrow and spice flavors extracted and concentrated in the broth. Six hours later, the liquid reduced by more than half. It is probably easier to make the soup the day before and let the broth chill out in the fridge overnight to scoop off the solidified fat. Today, I did a lot of straining. Once it’s clear from the spices and meat bits, slice the meatballs, in half and toss in the broth to heat thoroughly. You want the broth to be super duper hot for serving. We added more sugar to get the flavors closer to what we like. Next time, I’ll at least double the rock sugar. But it’s always season to taste. 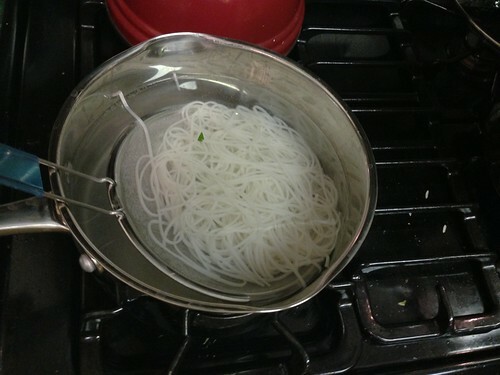 Prepare the pho noodles, soak them for 20 minutes in hot water and strain. Just before serving, drop a serving in boiling water for 20 seconds or so and strain. Thuan likes the noodles dried, so will do this a little more ahead of time. Now you’re ready to assemble the bowls. On top of your noodles, add a healthy handful of chopped green onions and cilantro. Whatever meat you like – today we just used raw, thinly sliced eye of round. Thinly slice onion and toss that on there, too. So this doesn’t come near Pho 75, but I must admit, it was pretty damn satisfying. There’s something about making a satisfying meal from scratch in the comfort of your own home. And I have yet to find a Pho restaurant that serves champagne. He even though it was good. “Totally edible. This ain’t bad.” Doesn’t sound like much, but I’ll take it. This is only my second time attempting homemade Pho and really only a year or so into my forays to serious Vietnamese cooking. Serve with bean sprouts, sliced jalapeno, lime, Thai basil, culantro, Sriracha and Hoisin sauce. Next time I’ll get a private lesson from my sister-in-law or mother-in-law and we’ll see what’s what! Sorry about the photos, I was lazy and used my iPhone vs. getting the real camera. Next time…quality! Looks good! I made pho post Thanksgiving with turkey leftover and I found it not as hard or daunting as I thought it would be to make… what did you think? I agree! Much easier than I thought – time is the most important ingredient. 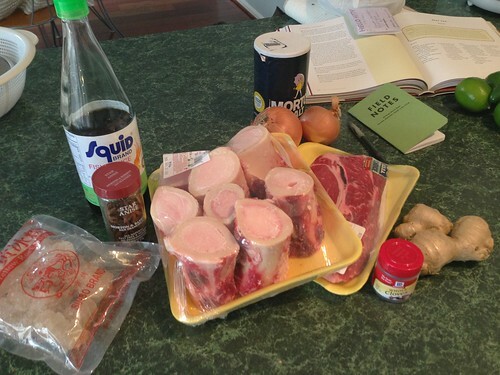 Will likely start making the broth on Saturday so I can wake up to a bowl of pho and watch Formula One at home!